Fasting is a ritual followed all over India. Every state has its own specific fasting foods. 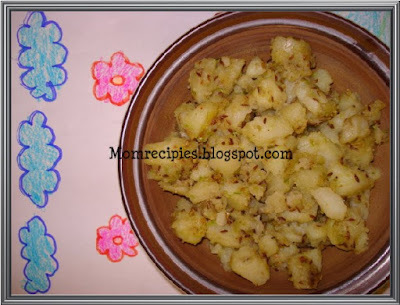 Potato Bhaji (sabzi) is very easy to make and very delicious. We generally make this on Fasting. 1) First, boil and Peel potatoes. Make medium cubes. 2) Heat a wok, and then add 1 tsp ghee. Let the Ghee become hot, add cumin seeds and chopped green chilies. Add potato cubes. Stir on medium heat. 3) Add peanuts powder, salt and Sugar to taste. Stir well and cover with lid, let it cook for 2-3 minutes. Mix well. 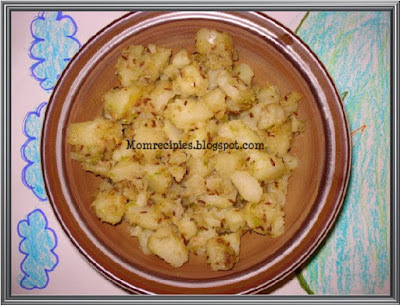 4) Serve with Kuttu ka atta ki Puri or Singhara ka atta ki puri. Add fresh grated coconut to enhance the taste. If you are not preparing this for fasting then you can use normal salt. I love this batatyachi bhaaji and can eat it just like that. 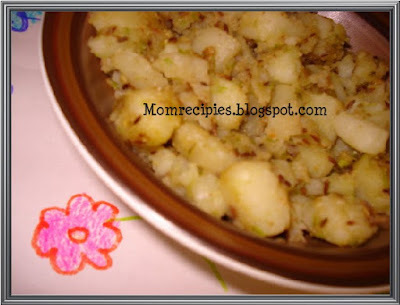 nice bhaaji,easy to make also.perfect on fasting day.It gives energy also. I love potato made like this. Seems like a perfect pair for rotis, looks yumm! that is yummy..is it sreeja's drawings below the food picture..? so cute..
Looks delicious, can have this for main course. It looks wonderful. I would love to taste it!